There are two species of Corellas that inhabit NSW, the Little Corella (Cacatua sanguinea) and the Long Billed Corella (Cacatua tenuirosris). 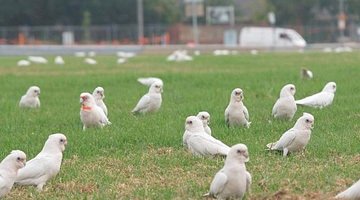 Both birds are large white cockatoos with little or no pink on their throats. These cockatoos form large flocks and inflict vast amounts of damage to crops in rural areas. In recent time they have become infamous with the damage they cause to golf clubs and turfed areas like playing fields and council parks. These birds are a protected species and a permit is required from the National Parks & Wildlife Service before any reduction can be undertaken.